There's more than just one reason. That's Meghan's mother with the sweet couple, so it's safe to say they're more than comfortable with each other at this point. But are all royals allowed to cuddle up to their partners? We all already know that Prince William and Kate Middleton don't really hold hands in public. 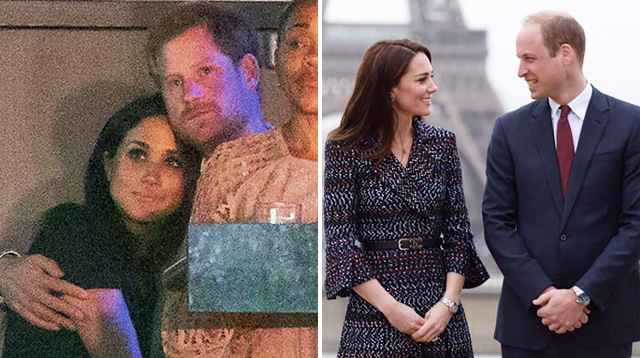 Royal etiquette expert Myka Meier says, "The couple are likely to show very little PDA, if any, to remain professional during their designated roles abroad." Additionally, if we look at the royal family, Prince William is the heir to the British throne; Prince Harry is sixth in line. Vogue.com reports, "William and Kate, by nature, have to appear a bit more prim and proper: They are, after all, soon-to-be heads of state, representing a whole people, a whole nation, a whole commonwealth. Reports throughout the years suggest William looks to the Queen, the very woman whose job he will inherit, for guidance on how to act in public. The Queen seldom shows affection to Prince Philip in public—a choice that could be described as a “protocol,” but not strong enough to be a downright rule."